Neptune is the eight planet from our Sun, one of the four gas giants, and one of the four outer planets in our Solar System. Since the “demotion” of Pluto by the IAU to the status of a dwarf planet – and/or Plutoid and Kuiper Belt Object (KBO) – Neptune is now considered to be the farthest planet in our Solar System. As one of the planets that cannot be seen with the naked eye, Neptune was not discovered until relatively recently. And given its distance, it has only been observed up close on one occasion – in 1989 by the Voyager 2 spaceprobe. Nevertheless, what we’ve come to know about this gas (and ice) giant in that time has taught us much about the outer Solar System and the history of its formation. Neptune’s discovery did not take place until the 19th century, though there are indications that it was observed before long that. For instance, Galileo’s drawings from December 28th, 1612, and January 27th, 1613, contained plotted points which are now known to match up with the positions of Neptune on those dates. However, in both cases, Galileo appeared to have mistaken it for a star. 1821, French astronomer Alexis Bouvard published astronomical tables for the orbit of Uranus. Subsequent observations revealed substantial deviations from the tables, which led Bouvard to hypothesize that an unknown body was perturbing Uranus’ orbit through gravitational interaction. In 1843, English astronomer John Couch Adams began work on the orbit of Uranus using the data he had and produced several different estimates in the following years of the planet’s orbit. In 1845–46, Urbain Le Verrier, independently of Adams, developed his own calculations, which he shared with Johann Gottfried Galle of the Berlin Observatory. Galle confirmed the presence of a planet at the coordinates specified by Le Verrier on September 23rd, 1846. The announcement of the discovery was met with controversy, as both Le Verrier and Adams claimed responsibility. Eventually, an international consensus emerged that both Le Verrier and Adams jointly deserved credit. However, a re-evaluation by historians in 1998 of the relevant historical documents led to the conclusion that Le Verrier was more directly responsible for the discovery and deserves the greater share of the credit. Claiming the right of discovery, Le Verrier suggested the planet be named after himself, but this met with stiff resistance outside of France. He also suggested the name Neptune, which was gradually accepted by the international community. This was largely because it was consistent with the nomenclature of the other planets, all of which were named after deities from Greco-Roman mythology. With a mean radius of 24,622 ± 19 km, Neptune is the fourth largest planet in the Solar System and four times as large as Earth. But with a mass of 1.0243×1026 kg – which is roughly 17 times that of Earth – it is the third most massive, outranking Uranus. The planet has a very minor eccentricity of 0.0086, and orbits the Sun at a distance of 29.81 AU (4.459 x 109 km) at perihelion and 30.33 AU (4.537 x 109 km) at aphelion. Neptune takes 16 h 6 min 36 s (0.6713 days) to complete a single sidereal rotation, and 164.8 Earth years to complete a single orbit around the Sun. This means that a single day lasts 67% as long on Neptune, whereas a year is the equivalent of approximately 60,190 Earth days (or 89,666 Neptunian days). Because Neptune’s axial tilt (28.32°) is similar to that of Earth (~23°) and Mars (~25°), the planet experiences similar seasonal changes. Combined with its long orbital period, this means that the seasons last for forty Earth years. Also owing to its axial tilt being comparable to Earth’s is the fact that the variation in the length of its day over the course of the year is not any more extreme than it on Earth. Neptune’s orbit also has a profound impact on the region directly beyond it, known as the Kuiper Belt (otherwise known as the “Trans-Neptunian Region”). Much in the same way that Jupiter’s gravity dominates the Asteroid Belt, shaping its structure, so Neptune’s gravity dominates the Kuiper Belt. Over the age of the Solar System, certain regions of the Kuiper belt became destabilised by Neptune’s gravity, creating gaps in the Kuiper belt’s structure. There also exists orbits within these empty regions where objects can survive for the age of the Solar System. These resonances occur when Neptune’s orbital period is a precise fraction of that of the object – meaning they complete a fraction of an orbit for every orbit made by Neptune. The most heavily populated resonance in the Kuiper belt, with over 200 known objects, is the 2:3 resonance. Objects in this resonance complete 2 orbits for every 3 of Neptune, and are known as plutinos because the largest of the known Kuiper belt objects, Pluto, is among them. Although Pluto crosses Neptune’s orbit regularly, the 2:3 resonance ensures they can never collide. Neptune has a number of known trojan objects occupying both the Sun–Neptune L4 and L5 Lagrangian Points – regions of gravitational stability leading and trailing Neptune in its orbit. Some Neptune trojans are remarkably stable in their orbits, and are likely to have formed alongside Neptune rather than being captured. Due to its smaller size and higher concentrations of volatiles relative to Jupiter and Saturn, Neptune (much like Uranus) is often referred to as an “ice giant” – a subclass of a giant planet. Also like Uranus, Neptune’s internal structure is differentiated between a rocky core consisting of silicates and metals; a mantle consisting of water, ammonia and methane ices; and an atmosphere consisting of hydrogen, helium and methane gas. The core of Neptune is composed of iron, nickel and silicates, with an interior model giving it a mass about 1.2 times that of Earth. The pressure at the center is estimated to be 7 Mbar (700 GPa), about twice as high as that at the center of Earth, and with temperatures as high as 5,400 K. At a depth of 7000 km, the conditions may be such that methane decomposes into diamond crystals that rain downwards like hailstones. The mantle is equivalent to 10 – 15 Earth masses and is rich in water, ammonia and methane. This mixture is referred to as icy even though it is a hot, dense fluid, and is sometimes called a “water-ammonia ocean”. Meanwhile, the atmosphere forms about 5% to 10% of its mass and extends perhaps 10% to 20% of the way towards the core, where it reaches pressures of about 10 GPa – or about 100,000 times that of Earth’s atmosphere. Increasing concentrations of methane, ammonia and water are found in the lower regions of the atmosphere. Unlike Uranus, Neptune’s composition has a higher volume of ocean, whereas Uranus has a smaller mantle. At high altitudes, Neptune’s atmosphere is 80% hydrogen and 19% helium, with a trace amount of methane. As with Uranus, this absorption of red light by the atmospheric methane is part of what gives Neptune its blue hue, although Neptune’s is darker and more vivid. Because Neptune’s atmospheric methane content is similar to that of Uranus, some unknown atmospheric constituent is thought to contribute to Neptune’s more intense coloring. Neptune’s atmosphere is subdivided into two main regions: the lower troposphere (where temperature decreases with altitude), and the stratosphere (where temperature increases with altitude). The boundary between the two, the tropopause, lies at a pressure of 0.1 bars (10 kPa). The stratosphere then gives way to the thermosphere at a pressure lower than 10-5 to 10-4 microbars (1 to 10 Pa), which gradually transitions to the exosphere. Neptune’s spectra suggest that its lower stratosphere is hazy due to condensation of products caused by the interaction of ultraviolet radiation and methane (i.e. photolysis), which produces compounds such as ethane and ethyne. The stratosphere is also home to trace amounts of carbon monoxide and hydrogen cyanide, which are responsible for Neptune’s stratosphere being warmer than that of Uranus. For reasons that remain obscure, the planet’s thermosphere experiences unusually high temperatures of about 750 K (476.85 °C/890 °F). The planet is too far from the Sun for this heat to be generated by ultraviolet radiation, which means another heating mechanism is involved – which could be the atmosphere’s interaction with ion’s in the planet’s magnetic field, or gravity waves from the planet’s interior that dissipate in the atmosphere. Because Neptune is not a solid body, its atmosphere undergoes differential rotation. The wide equatorial zone rotates with a period of about 18 hours, which is slower than the 16.1-hour rotation of the planet’s magnetic field. By contrast, the reverse is true for the polar regions where the rotation period is 12 hours. This differential rotation is the most pronounced of any planet in the Solar System, and results in strong latitudinal wind shear and violent storms. The three most impressive were all spotted in 1989 by the Voyager 2 space probe, and then named based on their appearances. The first to be spotted was a massive anticyclonic storm measuring 13,000 x 6,600 km and resembling the Great Red Spot of Jupiter. Known as the Great Dark Spot, this storm was not spotted five later (Nov. 2nd, 1994) when the Hubble Space Telescope looked for it. Instead, a new storm that was very similar in appearance was found in the planet’s northern hemisphere, suggesting that these storms have a shorter life span than Jupiter’s. The Scooter is another storm, a white cloud group located farther south than the Great Dark Spot. This nickname first arose during the months leading up to the Voyager 2 encounter in 1989, when the cloud group was observed moving at speeds faster than the Great Dark Spot. The Small Dark Spot, a southern cyclonic storm, was the second-most-intense storm observed during the 1989 encounter. It was initially completely dark; but as Voyager 2 approached the planet, a bright core developed and could be seen in most of the highest-resolution images. Neptune has 14 known satellites, all but one of which are named after Greek and Roman deities of the sea (S/2004 N 1 is currently unnamed). These moons are divided into two groups – the regular and irregular moons – based on their orbit and proximity to Neptune. Neptune’s Regular Moons – Naiad, Thalassa, Despina, Galatea, Larissa, S/2004 N 1, and Proteus – are those that are closest to the planet and which follow circular, prograde orbits that lie in the planet’s equatorial plane. They range in distance from 48,227 km (Naiad) to 117,646 km (Proteus) from Neptune, and all but the outermost two (S/2004 N 1, and Proteus) orbit Neptune slower than its orbital period of 0.6713 days. Based on observational data and assumed densities, these moons range in size and mass from 96 x 60 x 52 km and 1.9 x 1017 kg (Naiad) to 436 x 416 x 402 km and 50.35 x 1017 kg (Proteus). This composite Hubble Space Telescope picture shows the location of a newly discovered moon, designated S/2004 N 1, orbiting the giant planet Neptune, nearly 4.8 billion km (3 billion miles) from Earth. Credit: NASA, ESA, and M. Showalter (SETI Institute). With the exception of Larissa and Proteus (which are largely rounded) all of Neptune’s inner moons are believed to be elongated in shape. Their spectra also indicates that they are made from water ice contaminated by some very dark material, probably organic compounds. In this respect, the inner Neptunian moons are similar to the inner moons of Uranus. Neptune’s irregular moons consist of the planet’s remaining satellites (including Triton). They generally follow inclined eccentric and often retrograde orbits far from Neptune. The only exception is Triton, which orbits close to the planet, following a circular orbit, though retrograde and inclined. In order of their distance from the planet, the irregular moons are Triton, Nereid, Halimede, Sao, Laomedeia, Neso and Psamathe – a group that includes both prograde and retrograde objects. With the exception of Triton and Nereid, Neptune’s irregular moons are similar to those of other giant planets and are believed to have been gravitationally captured by Neptune. In terms of size and mass, the irregular moons are relatively consistent, ranging from approximately 40 km in diameter and 4 x 1016 kg in mass (Psamathe) to 62 km and 16 x 1016 kg for Halimede. Triton and Nereid are unusual irregular satellites and are thus treated separately from the other five irregular Neptunian moons. Between these two and the other irregular moons, four major differences have been noted. First of all, they are the largest two known irregular moons in the Solar System. Triton itself is almost an order of magnitude larger than all other known irregular moons and comprises more than 99.5% of all the mass known to orbit Neptune (including the planet’s rings and thirteen other known moons). With a mean diameter of around 2700 km and a mass of 214080 ± 520 x 1017 kg, Triton is the largest of Neptune’s moons, and the only one large enough to achieve hydrostatic equilibrium (i.e. is spherical in shape). At a distance of 354,759 km from Neptune, it also sits between the planet’s inner and outer moons. Triton follows a retrograde and quasi-circular orbit, and is composed largely of nitrogen, methane, carbon dioxide and water ices. With a geometric albedo of more than 70% and a Bond albedo as high as 90%, it is also one of the brightest objects in the Solar System. The surface has a reddish tint, owning to the interaction of ultraviolet radiation and methane, causing tholins. Triton is also one of the coldest moons in the Solar System, with surface temperature of about 38 K (-235.2 °C). However, owing to the moon being geologically active (which results in cryovolcanism) and surface temperature variations that cause sublimation, Triton is one of only two moons in the Solar System that has a substantial atmosphere. Much like it’s surface, this atmosphere is composed primarily of nitrogen with small amounts of methane and carbon monoxide, and with an estimated pressure of about 14 nanobar. Triton has a relatively high density of about 2 g/cm3 indicating that rocks constitute about two thirds of its mass, and ices (mainly water ice) the remaining one third. There also may be a layer of liquid water deep inside Triton, forming a subterranean ocean. Surface features include the large southern polar cap, older cratered planes cross-cut by graben and scarps, as well as youthful features caused by endogenic resurfacing. Because of its retrograde orbit and relative proximity to Neptune (closer than the Moon is to Earth), Triton is grouped with the planet’s irregular moons (see below). In addition, it is believed to be a captured object, possibly a dwarf planet that was once part of the Kuiper Belt. At the same time, these orbital characteristics are the reason why Triton experiences tidal deceleration. and will eventually spiral inward and collide with the planet in about 3.6 billion years. Nereid is the third-largest moon of Neptune. It has a prograde but very eccentric orbit and is believed to be a former regular satellite that was scattered to its current orbit through gravitational interactions during Triton’s capture. Water ice has been spectroscopically detected on its surface. Nereid shows large, irregular variations in its visible magnitude, which are probably caused by forced precession or chaotic rotation combined with an elongated shape and bright or dark spots on the surface. Neptune has five rings, all of which are named after astronomers who made important discoveries about the planet – Galle, Le Verrier, Lassell, Arago, and Adams. The rings are composed of at least 20% dust (with some containing as much as 70%) while the rest of the material consists of small rocks. The planet’s rings are difficult to see because they are dark and vary in density and size. The Galle ring was named after Johann Gottfried Galle, the first person to see the planet using a telescope; and at 41,000–43,000 km, it is the nearest of Neptune’s rings. The La Verrier ring – which is very narrow at 113 km in width – is named after French astronomer Urbain Le Verrier, the planet’s co-founder. At a distance of between 53,200 and 57,200 km from Neptune (giving it a width of 4,000 km) the Lassell ring is the widest of Neptune’s rings. This ring is named after William Lassell, the English astronomer who discovered Triton just seventeen days after Neptune was discovered. The Arago ring is 57,200 kilometers from the planet and less than 100 kilometers wide. This ring section is named after Francois Arago, Le Verrier’s mentor and the astronomer who played an active role in the dispute over who deserved credit for discovering Neptune. The outer Adams ring was named after John Couch Adams, who is credited with the co-discovery of Neptune. Although the ring is narrow at only 35 kilometers wide, it is the most famous of the five due to its arcs. These arcs accord with areas in the ring system where the material of the rings is grouped together in a clump, and are the brightest and most easily observed parts of the ring system. Although the Adams ring has five arcs, the three most famous are the “Liberty”, “Equality”, and “Fraternity” arcs. Scientists have been traditionally unable to explain the existence of these arcs because, according to the laws of motion, they should distribute the material uniformly throughout the rings. However, stronomers now estimate that the arcs are corralled into their current form by the gravitational effects of Galatea, which sits just inward from the ring. The rings of Neptune are very dark, and probably made of organic compounds that have been altered due to exposition to cosmic radiation. This is similar to the rings of Uranus, but very different to the icy rings around Saturn. They seem to contain a large quantity of micrometer-sized dust, similar in size to the particles in the rings of Jupiter. It’s believed that the rings of Neptune are relatively young – much younger than the age of the Solar System, and much younger than the age of Uranus’ rings. Consistent with the theory that Triton was a KBO that was seized, by Neptune’s gravity, they are believed to be the result of a collision between some of the planet’s original moons. The Voyager 2 probe is the only spacecraft to have ever visited Neptune. The spacecraft’s closest approach to the planet occurred on August 25th, 1989, which took place at a distance of 4,800 km (3,000 miles) above Neptune’s north pole. Because this was the last major planet the spacecraft could visit, it was decided to make a close flyby of the moon Triton – similar to what had been done for Voyager 1‘s encounter with Saturn and its moon Titan. The spacecraft performed a near-encounter with the moon Nereid before it came to within 4,400 km of Neptune’s atmosphere on August 25th, then passed close to the planet’s largest moon Triton later the same day. The spacecraft verified the existence of a magnetic field surrounding the planet and discovered that the field was offset from the center and tilted in a manner similar to the field around Uranus. Neptune’s rotation period was determined using measurements of radio emissions and Voyager 2 also showed that Neptune had a surprisingly active weather system. Six new moons were discovered during the flyby, and the planet was shown to have more than one ring. While no missions to Neptune are currently being planned, some hypothetical missions have been suggested. For instance, a possible Flagship Mission has been envisioned by NASA to take place sometime during the late 2020s or early 2030s. Other proposals include a possible Cassini-Huygens-style “Neptune Orbiter with Probes”, which was suggested back in 2003. Another, more recent proposal by NASA was for Argo – a flyby spacecraft that would be launched in 2019, which would visit Jupiter, Saturn, Neptune, and a Kuiper belt object. The focus would be on Neptune and its largest moon Triton, which would be investigated around 2029. With its icy-blue color, liquid surface, and wavy weather patterns, Neptune was appropriately named after the Roman god of the sea. And given its distance from our planet, there is still a great deal that remains to be learned about it. In the coming decades, one can only hope that a mission to the outer Solar System and/or Kuiper Belt includes a flyby of Neptune. 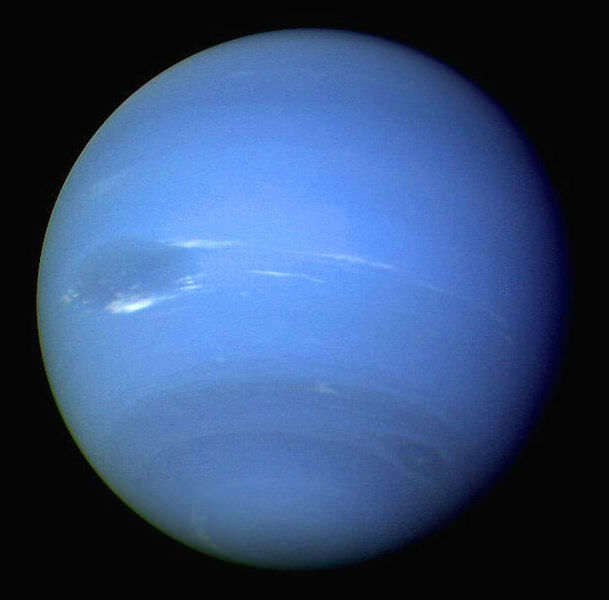 We have many interesting articles about Neptune here at Universe Today. Below is a comprehensive list for your viewing (and possibly researching) pleasure! What is Neptune Made Of? How Long is a Day on Neptune? How Far is Neptune from Earth? How Long is a Year on Neptune? How Long Does it Take Neptune to Orbit the Sun? How Many Moons Does Neptune Have? How Did Neptune Get its Name? In our Solar System, astronomers often divide the planets into two groups — the inner planets and the outer planets. The inner planets are closer to the Sun and are smaller and rockier. The outer planets are further away, larger and made up mostly of gas. The inner planets (in order of distance from the sun, closest to furthest) are Mercury, Venus, Earth and Mars. 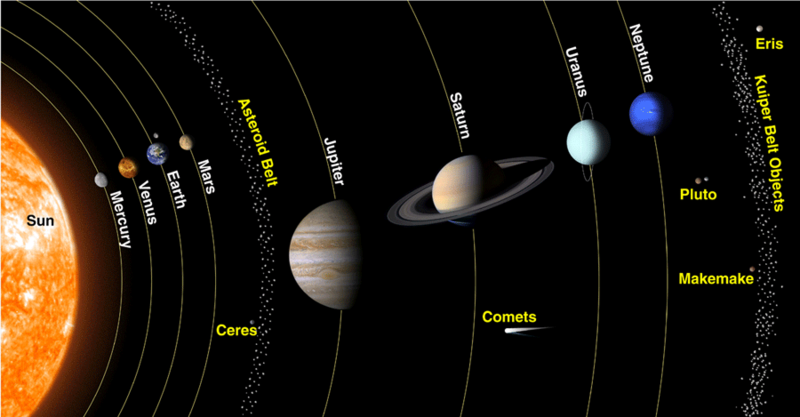 After an asteroid belt comes the outer planets, Jupiter, Saturn, Uranus and Neptune. The interesting thing is, in some other planetary systems discovered, the gas giants are actually quite close to the sun. This makes predicting how our Solar System formed an interesting exercise for astronomers. Conventional wisdom is that the young Sun blew the gases into the outer fringes of the Solar System and that is why there are such large gas giants there. However, some extrasolar systems have “hot Jupiters” that orbit close to their Sun. The four inner planets are called terrestrial planets because their surfaces are solid (and, as the name implies, somewhat similar to Earth — although the term can be misleading because each of the four has vastly different environments). They’re made up mostly of heavy metals such as iron and nickel, and have either no moons or few moons. Below are brief descriptions of each of these planets based on this information from NASA. Mercury: Mercury is the smallest planet in our Solar System and also the closest. It rotates slowly (59 Earth days) relative to the time it takes to rotate around the sun (88 days). The planet has no moons, but has a tenuous atmosphere (exosphere) containing oxygen, sodium, hydrogen, helium and potassium. The NASA MESSENGER (MErcury Surface, Space ENvironment, GEochemistry, and Ranging) spacecraft is currently orbiting the planet. Venus: Venus was once considered a twin planet to Earth, until astronomers discovered its surface is at a lead-melting temperature of 900 degrees Fahrenheit (480 degrees Celsius). The planet is also a slow rotator, with a 243-day long Venusian day and an orbit around the sun at 225 days. Its atmosphere is thick and contains carbon dioxide and nitrogen. The planet has no rings or moons and is currently being visited by the European Space Agency’s Venus Express spacecraft. Earth: Earth is the only planet with life as we know it, but astronomers have found some nearly Earth-sized planets outside of our solar system in what could be habitable regions of their respective stars. It contains an atmosphere of nitrogen and oxygen, and has one moon and no rings. Many spacecraft circle our planet to provide telecommunications, weather information and other services. Mars: Mars is a planet under intense study because it shows signs of liquid water flowing on its surface in the ancient past. Today, however, its atmosphere is a wispy mix of carbon dioxide, nitrogen and argon. It has two tiny moons (Phobos and Deimos) and no rings. A Mars day is slightly longer than 24 Earth hours and it takes the planet about 687 Earth days to circle the Sun. There’s a small fleet of orbiters and rovers at Mars right now, including the large NASA Curiosity rover that landed in 2012. The outer planets (sometimes called Jovian planets or gas giants) are huge planets swaddled in gas. They all have rings and all of plenty of moons each. Despite their size, only two of them are visible without telescopes: Jupiter and Saturn. Uranus and Neptune were the first planets discovered since antiquity, and showed astronomers the solar system was bigger than previously thought. Below are brief descriptions of each of these planets based on this information from NASA. Jupiter: Jupiter is the largest planet in our Solar System and spins very rapidly (10 Earth hours) relative to its orbit of the sun (12 Earth years). Its thick atmosphere is mostly made up of hydrogen and helium, perhaps surrounding a terrestrial core that is about Earth’s size. The planet has dozens of moons, some faint rings and a Great Red Spot — a raging storm happening for the past 400 years at least (since we were able to view it through telescopes). NASA’s Juno spacecraft is en route and will visit there in 2016. Saturn: Saturn is best known for its prominent ring system — seven known rings with well-defined divisions and gaps between them. How the rings got there is one subject under investigation. It also has dozens of moons. Its atmosphere is mostly hydrogen and helium, and it also rotates quickly (10.7 Earth hours) relative to its time to circle the Sun (29 Earth years). Saturn is currently being visited by the Cassini spacecraft, which will fly closer to the planet’s rings in the coming years. Near-infrared views of Uranus reveal its otherwise faint ring system, highlighting the extent to which it is tilted. Credit: Lawrence Sromovsky, (Univ. Wisconsin-Madison), Keck Observatory. Uranus: Uranus was first discovered by William Herschel in 1781. The planet’s day takes about 17 Earth hours and one orbit around the Sun takes 84 Earth years. Its mass contains water, methane, ammonia, hydrogen and helium surrounding a rocky core. It has dozens of moons and a faint ring system. There are no spacecraft slated to visit Uranus right now; the last visitor was Voyager 2 in 1986. Neptune: Neptune is a distant planet that contains water, ammmonia, methane, hydrogen and helium and a possible Earth-sized core. It has more than a dozen moons and six rings. The only spacecraft to ever visit it was NASA’s Voyager 2 in 1989. What are The Outer Planets of the Solar System? Astronomers have divided the eight planets of our solar system into the inner planets and the outer planets. The 4 inner planets are the closest to the Sun, and the outer planets are the other four – Jupiter, Saturn, Uranus, and Neptune. The outer planets are also called the Jovian planets or gas giants. Like the inner planets, the outer planets have similar characteristics to one another. The outer planets are so much larger than the inner planets that they make up 99 percent of the mass of the celestial bodies that orbit the Sun. Although mainly composed of gas, the outer planets also have other ingredients. Somewhere at the center is what scientist refer to as a rocky core, although it is actually composed of liquid heavy metals. While the inner planets have few or no moons, the outer planets have dozens each. The inner and outer planets are separated by the asteroid belt. Jupiter is the largest planet in our Solar System with a mass more than three hundred times Earth’s mass. Jupiter is not only the largest planet, it also has the most moons – 63 identified so far. Jupiter is one of the brightest objects in the sky and has a very stormy atmosphere. One major storm, the Great Red Spot, is as big as the Earth. Saturn is hard to miss with its distinctive, large rings. Although all of the outer planets have rings, Saturn’s are the most visible ones. Astronomers did not know that there any other planets with rings until 1977 when Uranus’ rings were discovered. Soon after that, astronomers discovered rings around both Jupiter and Neptune. Uranus has the smallest mass of the outer planets, although in size it’s a little bigger than Uranus. It is the only planet to rotate on its side. Scientists are unsure why it rotates that way, although there are a couple theories. One suggests it suffered a major collision and another hypothesizes that smaller shifts during the planets’ formation caused its unusual rotation. Neptune is the final outer planet in the solar system. 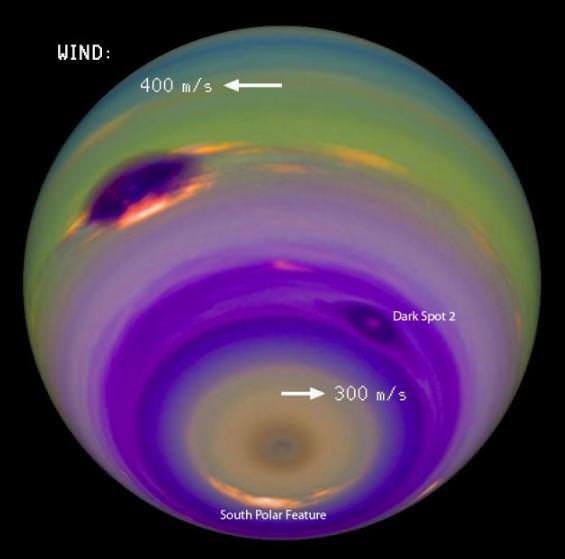 Neptune’s winds are the fastest of any planets in the Solar System and can reach more than 1,200 miles per hour. While all of the outer planets’ atmospheres contain hydrogen and helium, Neptune and Uranus contain significant amounts of what astronomers call ices. These ices include water, ammonia, and methane. 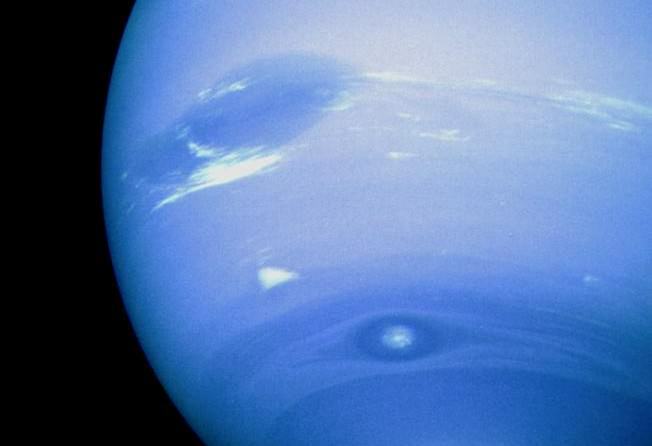 The methane in Neptune and Uranus is what gives the planets their blue color. Check out these other articles from Universe Today on the outer solar system and the inner solar system. If you are searching for more information, NASA has many articles, including one on the planets and Science Daily is also a rich resource for information on the outer planets. Astronomy Cast has a number of episodes on the Jovian planets including this one on Jupiter.